Though they're not exactly like Batman, one of the first things that come to mind when people think of a police officer is probably the duty belt. People who are interested in criminal justice careers often spend a lot of time wondering and asking about the tools on an officer's belt. As the primary means of carrying equipment, the importance of the duty belt has always been understood, even as police evolved from lowly members of the night watch carrying muskets and swords to a professional police force with gadgets galore. In order to perform their jobs effectively and keep themselves and others safe, law enforcement officers carry a host of interesting tools. Depending on how it's equipped, the duty belt can add another 10 pounds to a uniformed officer's weight. Some of the most common questions officers get asked are about the duty belt. Even officers from other agencies often talk to each other about the kind of equipment they carry. For those of you who are curious about what tools police officers use, let's take a look at what exactly is on a police officer's utility belt. As you look at a law enforcement officer from the front, the first thing you'll probably notice is the magazine pouch. The magazine pouch consists of two, and sometimes three, separate containers to hold extra magazines for the officer's firearm. Magazines, often called "clips" by the general public, contain extra rounds for the firearm and are used to feed live rounds into a semiautomatic weapon. Because most officers now carry automatic pistols, the magazine pouch has become a staple of the police utility belt. Flashlights have long been associated with police officers. These are not your typical "torches" you might find in the kitchen junk drawer, though. Instead, officers carry long and heavy lights with halogen bulbs or LEDs, such as Maglites. The halogen lights are so powerful and so hot that they have been known to burn small holes in car seats and even uniforms. The Maglite is usually rechargeable and rests in a charger in the patrol car until the officer feels she may need it. When she gets out of the car, especially at night, she'll slip it in a flashlight ring that hangs on the belt. Many officers now carry a second flashlight that is smaller and more tactical. This light is also especially bright and usually has an LED bulb. The tactical flashlight rests in a pouch on the officer's belt. It is especially useful for vehicle searches and for low and no-light shooting situations. The electronic control device, or ECD, has been a popular subject in the news for quite a while. Perhaps the best-known devices are made by Taser International. The term "Taser" has come to describe all varieties of ECDs, though the word properly refers to specific devices made by the Taser company. ECDs have been the topic of a great deal of controversy due to their apparent association with in-custody deaths of prisoners. It's important to note that the correlation is not necessarily a causation, though, and Taser International and other ECD manufacturers rigorously defend the use of their product. Law enforcement agencies collect and retain extensive data on the use of ECDs. The ECD serves as a deterrent as much as a weapon; in many situations, merely showing a resistant subject an ECD is has been shown to gain compliance. When deployed, the ECD works using the concept of neuromuscular incapacitation. Essentially, the electronic impulses from the ECD interrupt the electronic signals from the brain to the muscles, causing the subject to be temporarily incapacitated. Often called a "nightstick" by people outside of the industry, the police baton comes in many forms and serves just as many purposes. True, officers may necessarily use batons to strike unruly subjects who are resisting arrest. Believe it or not, though, they serve more purposes than that of a simple club. Using special hold techniques, police batons can be used to help restrain a subject until handcuffs can be applied. They are also very effective at blocking blows and strikes and helping officers to avoid injury. What would a police officer be without handcuffs? The hallmark of the law enforcement profession, handcuffs have become a symbol of a police officer's authority to make arrests. These seemingly simple tools are more complicated than they appear, and officers undergo extensive training at the academy in their use. Effective and efficient handcuffing techniques can often make the difference in keeping both the officer and the arrested subject safe from injury. In the United Kingdom, where the concept of modern policing as we now know it began, law enforcement officers do not regularly carry firearms. When the first police officers began to walk the streets of London in the mid-1800s, there was a concern that law enforcement officers would be too similar to an occupying army if they were armed. This aversion carries on today, with only officers in special units and special assignments carrying guns. By contrast, the pistol has been a part of American policing almost since the inception of a police force. Nearly every sworn officer in the United States carries at least one firearm, and quite often they may also carry a backup weapon hidden on their body. Though there are a few officers who still carry revolvers, most carry semiautomatic pistols. Popular manufacturers are Glock, Smith & Wesson, Beretta, and Sig Sauer. Currently, most departments carry a .40 caliber pistol, though there is a movement toward the larger .45 caliber round. Popularly known as "Mace," pepper spray actually comes in many forms and varieties. Some sprays have traces of tear gas, while others are simply a high concentration of capsaicin, the oil found in chili peppers that make them hot. Most police departments have fairly strict policies on the use of pepper spray. Officers are usually required to be exposed to the spray to experience their effects. This helps them be more aware and sympathetic to people they may be inclined to use it on, and it also helps them be prepared in the event they deploy it and become exposed accidentally in the field. Except for a very small segment of the population who may have an allergy, pepper spray is completely harmless. If only the capsaicin is used, the substance is completely natural. Its effectiveness comes from the extreme heat, up to 2 million Scoville units, which causes intense pain but does no damage. Though the duty belt has become a staple of a police uniform, it's important to remember that the equipment doesn't make the officer. 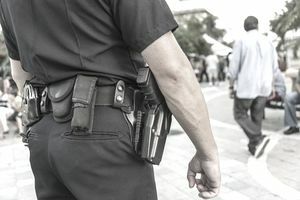 Rather, proper training and use of the equipment, along with the sound application of local, state, and federal statutes and of law enforcement principles and techniques make a good police officer a great one. The law enforcement toys and police gadgets may be fun and interesting, but they are first and foremost tools. Anyone interested in criminal justice careers must always keep in mind the commitment to protecting people and safeguarding rights. The tools on an officer's duty belt are just one of the means through which law enforcement professionals can achieve their goal of voluntary compliance with the law.